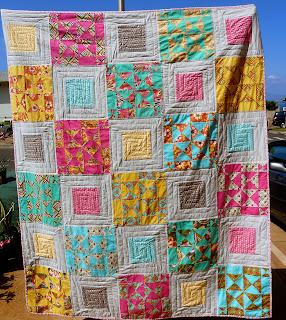 Woohoo, I finally finally finished my quilt using the blocks from the We Bee Modern Too bee. This was the first bee I had ever joined. I decided to send fabric to everyone and of course in my over cautious mode sent almost exact measurements, so some of my members couldn't finish the blocks because they didn't have enough fabric... whoops! Lesson learned. So these blocks came and sat, and sat, and sat.. I brought them to Hawaii thinking they'd be the first quilt I made... wrong. 9 months later, here we are, but its done! Finally! I wanted to break up the busyness of the blocks so I added the gray blocks between, those are also the only ones quilted with concentric circles. I'm not crazy about the dense quilting as it seems to take away from the coziness of a quilt for me. Quilt Size: approx. 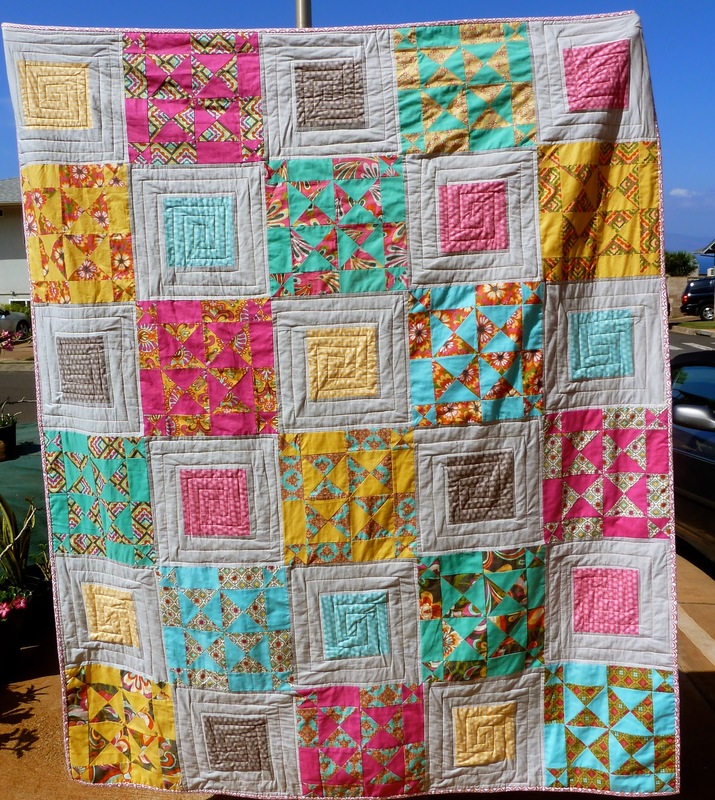 60"x 72"
Love the vibrancy of this quilt Jennifer. It's gorgeous. I think it looks great with those alternating blocks - good idea! Very nice! Looks great - nice feeling to have it done I bet! I really like how you broke it up! Great idea and a lovely finish. Very pretty. I like the dense quilting. The first photo is SO busy I was relieved to see how you had spaced those blocks on the finished quilt! Haha. They look great with those big grey blocks! Hopefully with some love the quilt will soften up a bit.